Is Jared Leto Teasing the Return of the Joker? It's possible -- just possible -- that audiences haven't seen the last of Jared Leto's Joker. Although the actor's performance, and physical appearance, in "Suicide Squad" proved divisive among fans and critics alike, the Oscar winner has made it clear he enjoyed the experience, although his co-stars may wish he hadn't been quite so devoted to the role. Now Leto may be hinting that he's not quite finished with the Clown Prince of Crime. 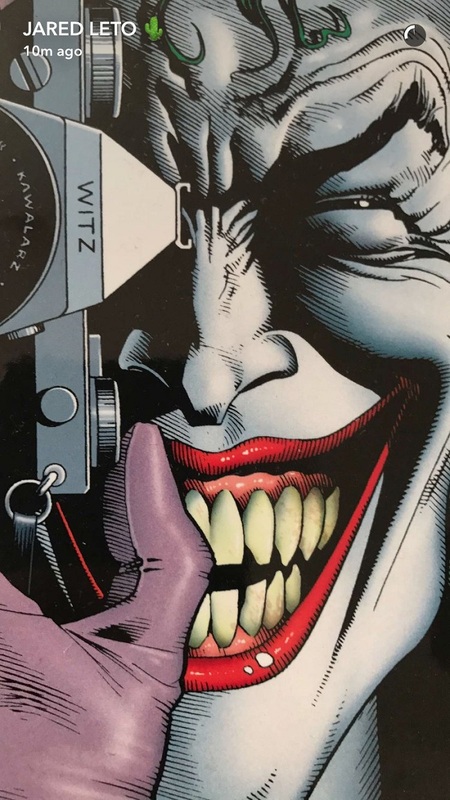 The actor has posted two intriguing images Wednesday on Snapchat, one part of Brian Bolland's iconic cover for the 1988 graphic novel "Batman: The Killing Joke," and the other a photo of a purple-and-gold Gucci jewel box containing a human tooth adorned in gold and silver. The first photo could mean virtually anything, but it's important to note that "Suicide Squad" director David Ayer released a photo of Leto reenacting Bolland's cover during the makeup process for the film. The second image, of the jewel box, is certainly more bizarre, but perhaps just as intriguing. It may be a nod to one of the teeth knocked out by Batman before the Joker was confined to Arkham Asylum (hence the metal grill in "Suicide Squad." Of course whether Leto is merely having fun with fans or teasing role in a future DC Films project -- perhaps the Ayer-directed "Gotham City Sirens" or Ben Affleck's "The Batman" -- remains to be seen.